25. There areon the highway: You never know when your next animal encounter will be. 1. It's the only English speaking country in Central America: Belize was occupied by the British, making it unique among its neighbors. 2. It was the center of the Mundo Maya: The Mayan once occupied Belize, as evidenced by the dozen or more protected archeological sites. Practically every buried mound you spot is a piece of history. 3. 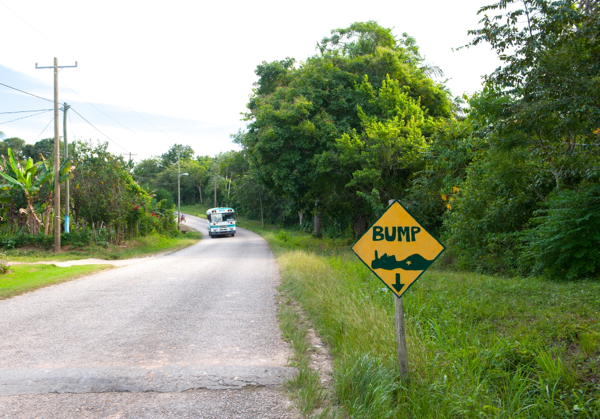 Most Belizeans are trilingual: They speak Kriol, Spanish and English. Some also speak additional languages, such as Garifuna, Mayan dialects, and German. 4. You can have a plate of coconut rice n' beans: Proof of Caribbean culture? Coconut rice and beans is sold on every corner, alongside a tasty stew of your choice. 5. You can eat African fufu and cassava: The Garinagu people, descendants from West Africa, settled along Belize's southern coast and brought with them their plantains and cassava. The result? Dishes like hudut--mashed plantains, also known as "fufu" in West Africa, served with a fish stew. 6. It's home to the second largest barrier reef in the world: Recognized as a World Heritage Site, the reef is abundant in marine life; whale shark diving is popular from March through June. 8. 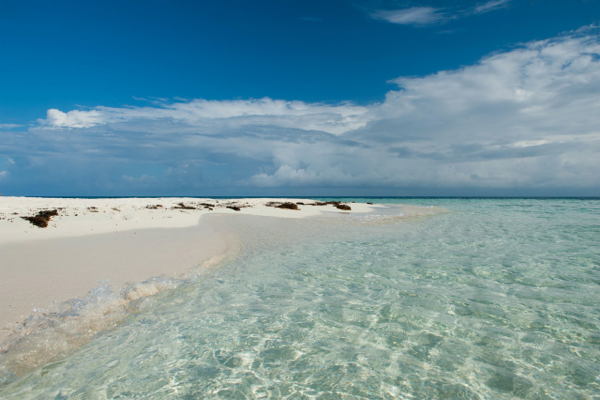 There are beaches and more than one hundred offshore islands: Just like its neighbors, Belize has beaches, and long stretches at that! 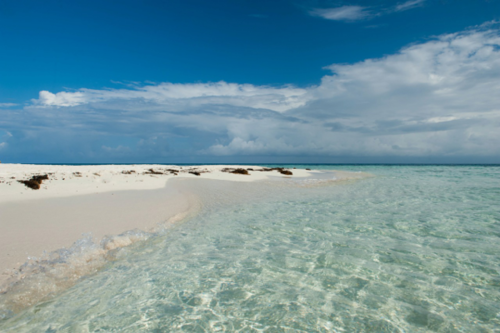 Try Placencia, Hopkins, or South Water Caye. 9. It's home to the black howler monkey: They make a startling sound and can wake you up at dawn. The black howler monkey is said to be one of the loudest animals in the world. 10. There are more than 300 species of birds: Belize is a major bird-watching destination, with species like the jabiru stork and the magnificent frigate. 11. There are snakes and wild cats: Hate to break it to ya, but there are snakes here, both venomous and nonvenomous. Of course, the likelihood you'll see one is low, unless you're hiking at night in a rainforest. The exciting part is spotting one of Belize's five cats: the jaguar, the jagarundi, the ocelot, the puma and the margay. 12. One of the infamous dishes is gibnut: Also nicknamed "Royal Rat," thanks to Queen Elizabeth who, during her first visit to Belize, enjoyed the dish not knowing that it was, in fact, rodent meat. 13. They still have hand-cranked ferries: One in the Cayo District, used to reach Xunantunich, and another Corozal to reach the Cerros site, these ferries are a flash back into the old Belize. 14. It's home to the largest sinkhole in the world: The Blue Hole is Belize's most recognized sight and in the top five dive sites in the world. It's more than 400 feet deep and more than 1,000 feet wide. 15. The tallest building is a Maya pyramid: The Caana temple at the Maya site of Caracol, rises 136 feet high. 16. There are no massive all inclusive or chain resorts: That's the beauty of Belize -- no monstruous concrete towers blocking that Caribbean view. 17. It's the size of New Hampshire: But there are only about 35 people per square mile, in a population of just over 300,000 -- the lowest population density in Central America. 18. 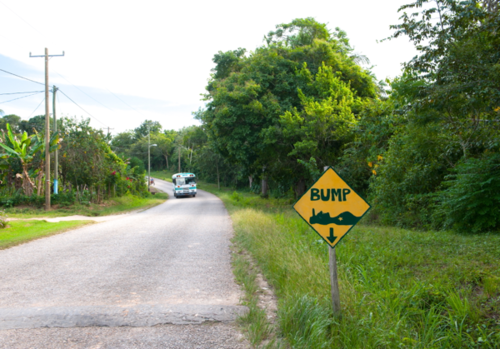 Speed bumps are called "sleeping policeman": Belizeans have lots of amusing Creole phrases. Look out for the road sign! 19. Every meal is consumed with Marie Sharpe: No dish is complete without a few drops of Marie Sharpe hot sauce. She's a local legend and makes the best hot sauce I've tasted anywhere (except Ethiopia). 20. Belizeans like their fried chicken with ketchup. 21. The most popular music is punta rock: It's an intoxicating dance beat popular across Central America; I call it Belize's dancehall. 22. You can pay in American dollars, anywhere, any time: A steady 2:1 exchange rate means you don't have to worry about exchanging your currency. 23. There are two Carnivals held every September: a Caribbean one in Belize City, and a Latin one in Orange Walk. 24. Chocolate is made here: Cacao trees grow in the deep southern district of Toledo and there's an annual Chocolate Festival held there every year, in May. 25. There are jaguar and tapir crossing signs on the highway: You never know when your next animal encounter will be. Photos courtesy of Lebawit Lily Girma.